Moreland Food Gardens Network: Garage Sale at Luscombe Garden - This Sunday (23 Sept) ! 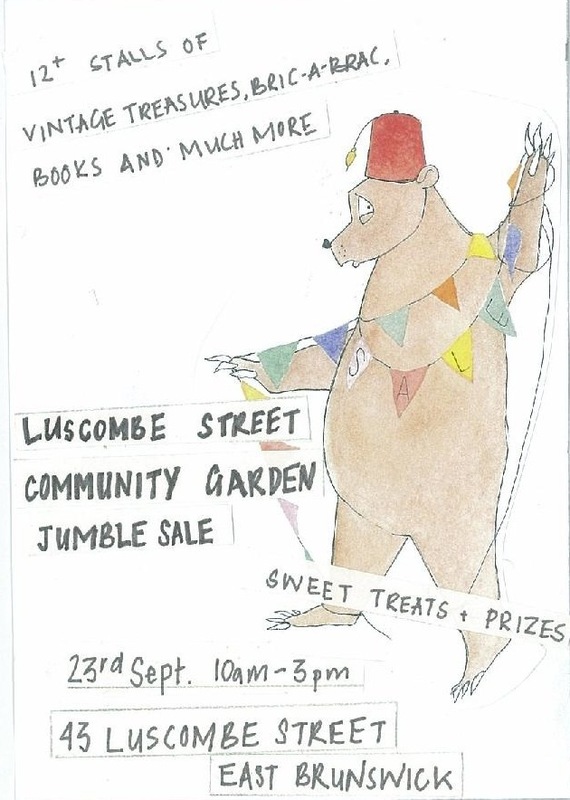 Garage Sale at Luscombe Garden - This Sunday (23 Sept) ! This is very exciting - we are having a Jumble Sale, THIS SUNDAY (23rd Sept), 10am-3pm(see attached). 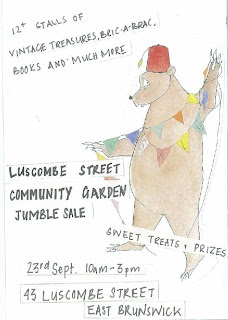 Come along and support the Luscombe St Community Garden - there's over 12 different stall holders selling their 2nd-hand wares. Plus there are some great prizes to be won in the raffle...and yoghurt! Also, you may consider de-cluttering your home this weekend, we will accept donations of (almost!) anything you want to be rid of. Just bring it along on the day, the earlier the better (contact me on 0439617251 if you want to drop stuff off before Sunday). Please pass this around to all your friends. There's enough bargains for everyone!